Stop guessing what keywords SERPs like, start knowing. Streamline SEO keyword management. Follow your competitors’ keyword use. The SEO Keyword Hound is the only WordPress SEO tool that tells you which keywords you should be using on your page and where to put them, based on how your competitors already are. 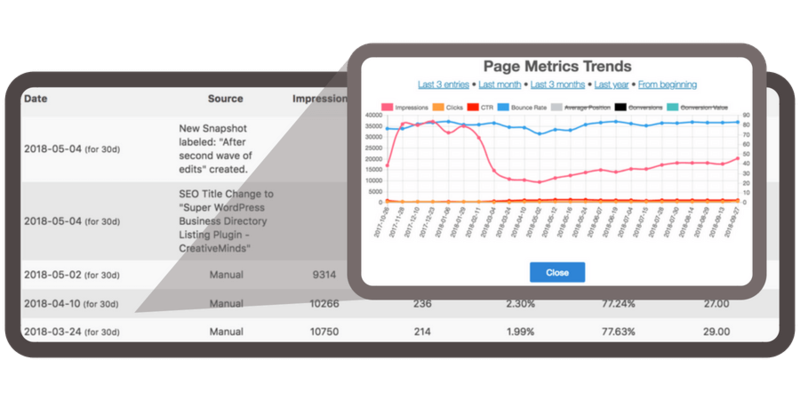 The Hound gives you page keyword use statistics, tracking metrics, and all the tools you need to optimize your page content directly within the WordPress page editor. Assess your SEO needs and choose a few WordPress pages to start on. 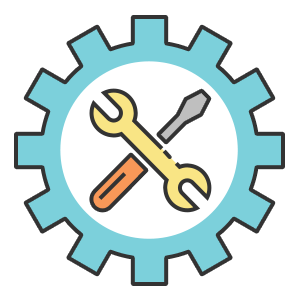 Refer to our extensive resources to learn more about general SEO and get the plugin setup. For those who are not very familiar with competitive analysis, our exclusive 80 minute video course will teach you how to locate keywords, competitors, search queries and walks through every step of the optimization process. What can I expect from the SEO Keyword Hound? You can expect a fully-fledged keyword KPI tracker with extensive tools to compare statistics such as keyword density, keyword placement and Moz Page Authority and Domain Authority to those of your competitors. The SEO Keyword Hound pulls data directly from Google Analytics and Moz, so your page SEO statistics are easy to keep up to date without ever leaving your WordPress dashboard. The SEO Keyword Hound locates juicy keyword opportunities you’ve been missing by comparing your keyword use directly with your competitors’. As the only WordPress SEO plugin or SEO tool that shows you which keywords you should be using AND helps you manage them, this is the perfect tool to finally get all your SEO keywords in focus and under control. Build a list of target search queries you want to rank for. Track which pages outrank you and the best keywords for each search phrase. Once targeted, you can optimize your content one search query at a time. Fetch a list of your page’s top competitors by each search query straight from Google’s SERP. Build a list of competitors and search query goals unique to each page or post. 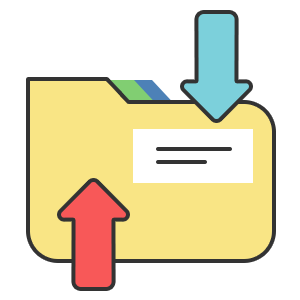 Easily move competitor lists between pages via cvs file import/export. Create a list of target keywords for your page and add them to the plugin individually or in bulk via cvs. 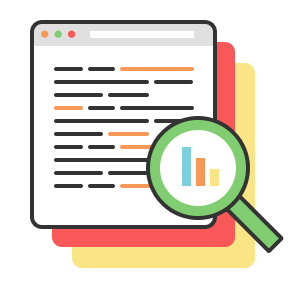 The Hound gives you powerful monitoring of every keyword and each of its synonyms, spelling variations, or abbreviations on your page in one place. Track keyword incidence and density in each part of your content, including title, URL, headers, first words and the alt attribute of images. Group keywords to keep your list manageable, no matter how big it grows. Instantly learn where you’re using keywords, and how often. The Hound directly compares your page’s content with your competitors’. Quickly discover what keywords your competitors are using, where they’re using them, and how often. Track the success of your SEO optimization efforts over time on the page and site level to understand which strategies work, so you can stop wasting time by targeting the wrong keywords and search queries for your site. 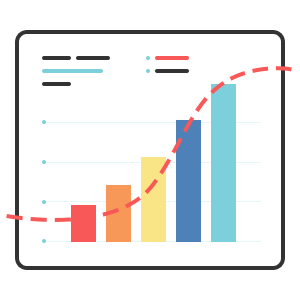 Track major optimization efforts and esential page metrics over time. Analyze page performance as it responds to optimization efforts to learn what works, and what doesn’t. We offer an exclusive 80 minute video course to guide you through SEO fundamentals and plugin setup, plus in-depth plugin documentation. You can quickly start mastering your site’s keyword use, no matter what your previous SEO knowledge is. Why Use The SEO Keyword Hound? The SEO Keyword Hound is an innovative WordPress SEO plugin that locates and targets keywords your competitors are using. Unlike other SEO tools, it gives one place to organize, manage, and track keyword lists within the WordPress editor. 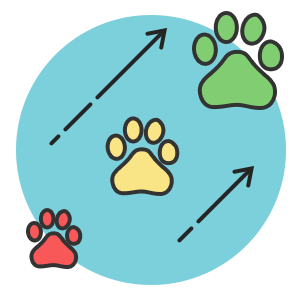 The Hound is the only SEO tool that directly compares keyword density and location with your competitors’. 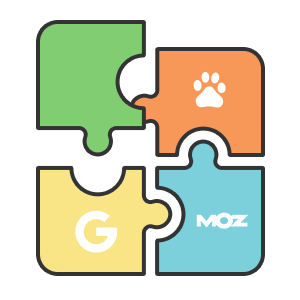 The Hound works great with other SEO tools like Yoast or SEOquake by targeting aspects SEO they do not address. Use The Hound to understand the impact of each change you make to your page’s SEO. Track page performance as you optimize content, to hone in on which keywords SERPs love, and which ones they don’t. To learn more about this plugin, check the product guide. Monitor keyword KPIs on the micro level (individual pages) and macro level (sitewide). Compare your page’s keyword incidence, density, and location with your competitors. Analyze keyword use between individual competitors or a group of competitors. 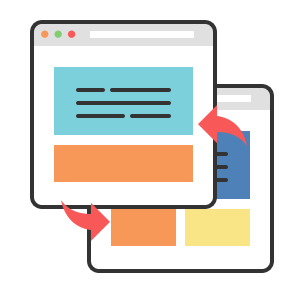 Set reminders for page owners to check page stats and regularly optimize content. Quickly manage keyword and competitor lists in bulk through CSV import and export. Integrated with Google Analytics and Moz, quickly fetch essential metrics from each source and put them side by side with your keyword and competitor list. Works exceptionally well with other SEO tools such as SEO by Yoast, SEOQuake, and Moz by addressing aspects of onsite SEO they do not. 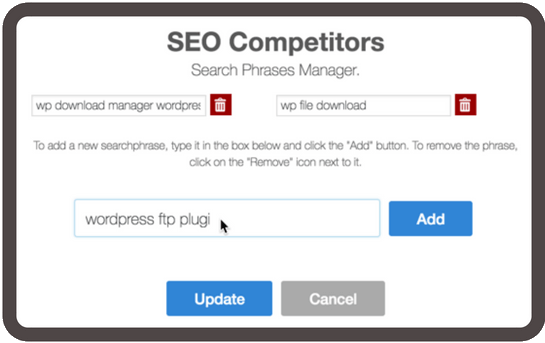 The tool still works great with just a handful of keywords and competitors on a few pages. Learn at your own pace and find your feet as you go. If the number of features seems daunting, be sure to watch our carefully crafted video tutorials. They explain every available setting, with case studies. Our documentation covers each setting in the plugin and tells you how they can be used, step by step. 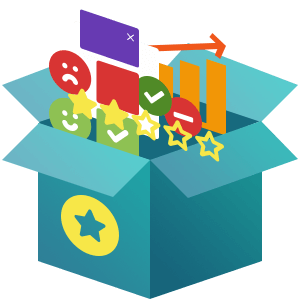 The plugin’s many advanced features give you the flexibility to constantly apply, test, and adapt your SEO content optimization strategy. Should the plugin look for keywords inside H1, H2, or H3? Should it analyze the first 100 or 200 words of the text separately? Define this and much more. Track your keyword list building and keyword use with a detailed log. Track page edit events made by which user, to track what changes are effective, made by whom. Every purchase of the SEO Keyword Hound plugin comes with a 1+ hour exclusive SEO video course. This course will quickly get you oriented on basic SEO strategies and using the tool itself. Watch below for a brief tour of the SEO Keyword Hound and intro to the video course. One Year License and Support + 30-day money back + Use Forever. We stand behind our products 100%. See our refund policy. Have more than five sites? Let us know, we do bulk pricing! Why you should upgrade to Pro? 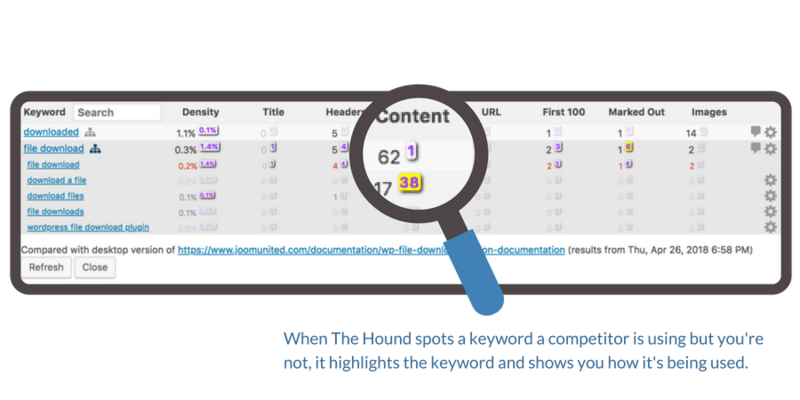 Free: Tailored Keyword Analysis base on criteria such as H1, H2 text only to just the first 100 words. 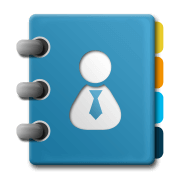 Pro: Manage a list of your competitors and mark important competitors. What do I need to use SEO Keyword Hound? In order to use SEO Keyword Hound, you need some basic SEO knowledge, familiarity with SEO tools such as Moz, and Google Analytics installed on your website. We have many resources to assist you with those aspects. Please check our blog posts, product guide and videos. I use Yoast SEO. What can SEO Keyword Hound add? A lot, actually! 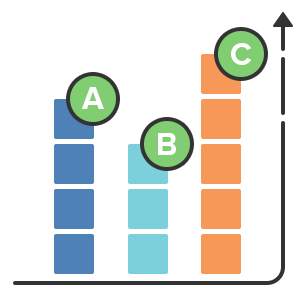 Yoast SEO and SEO Keyword Hound have very different scopes and complement each other. Yoast does a really good job at analyzing single posts in the present and providing general tips. 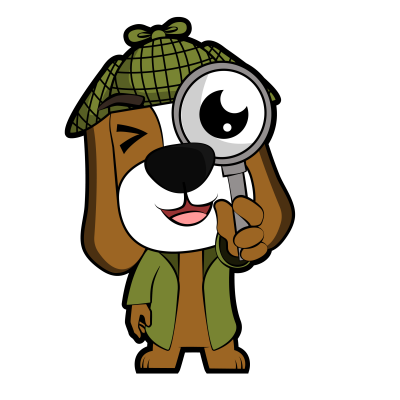 The Keyword Hound, however, manages and tracks keyword performance. It presents historical data on your content and that of your competitors, allowing for more comprehensive strategies. Learn more by reading this guide. Does SEO Keyword Hound improve my SEO automatically? This SEO friendly Keyword Hound plugin gives you powerful tools to put simple and complex strategies to action. 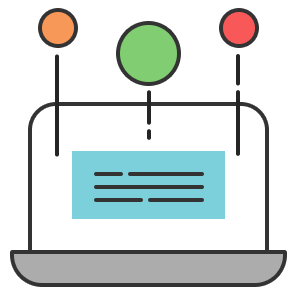 Components such as the keyword monitor and competitor dashboard provide valuable insight and require users’ input. 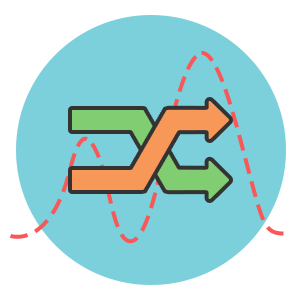 The plugin also provides handy shortcuts for collecting data from relevant such as Google Analytics. What is SEO, SERP, Keyword, and Competitive Analysis? 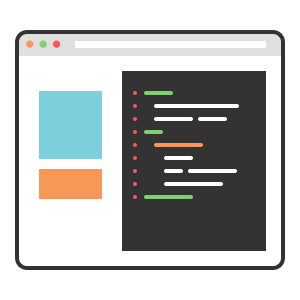 All these are fundamental concepts for any person or company with a website. SEO stands for search engine optimization, the group of strategies that aim to make your pages list higher on SERPs, or Search Engine Results Page. One of the most successful SEO tactics is Competitive Analysis, which involves understanding and measuring your rivals’ strong and weak points. 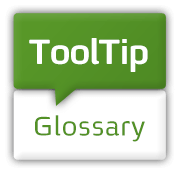 This evaluation takes in account the performance of keywords, those terms or expressions that users used during searches. Can I customize the visuals of SEO Keyword Hound? The plugin provides many options to customize the visuals of items such as competitors and labels. To see full list, please check the guide Settings – Metaboxes and Labels. Does SEO Keyword Hound Ensure my SEO Success? Yes, as the only WordPress SEO plugin or SEO tool on the market that shows you which keywords you should be using AND helps you manage them, this is the perfect tool to finally get all your SEO keywords in focus and under control and help your page become an SEO optimized. Can I expand this plugin with he News SEO, Video SEO, Local SEO and WooCommerce SEO extensions? 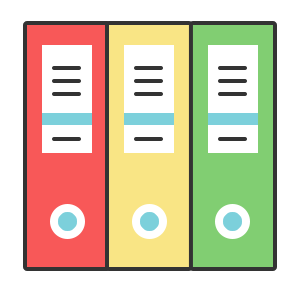 Do you provide SEO related Documentation? 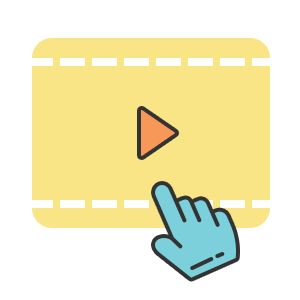 Yes, We have Video Tutorials for you, it helps you set up SEO step by step and provides you SEO tips to rank high. Does it redirect to the external Links? No, it does not redirect you to the unnecessary external links. How does it help in improving URLs? URLs play a crucial role in the SEO ranking, SEO Keyword Hound Plugin shows you the best possible keywords you should add to the Permalink URL. It also helps you to improve the Title, Meta description templating for better branding and consistent snippets in the search results. Does it help to Set canonical URLs? No, this SEO tool does not have this feature to help you set Set canonical URLs. Does it have Google preview, Twitter Preview and Facebook Preview feature? No, It does not have Google preview, Twitter Preview, and Facebook Preview features. 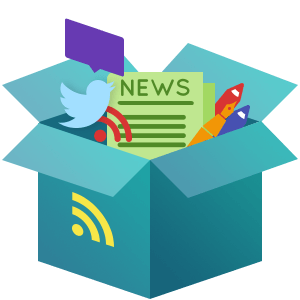 Google preview , breadcrumbs check, and page readability , you will get in the Yoast in the free version, for Twitter & Facebook Preview and internal linking suggestions, you will need Yoast’s paid version. Does it help tracking the visitors on the site after adding the keywords? SEO Keyword Hound works with Google Analytics which makes it easier to see how many visitors clicked your page and traffic on the page after adding the keywords to it. Where will I see the keywords and competitors list? 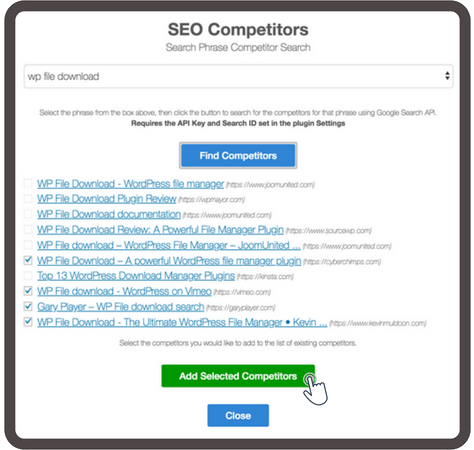 Keywords and Competitors you will see on the edit post, pages, and custom post types. Is it possible to hire your SEO expert for the optimization? 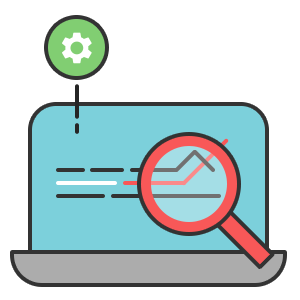 You can leave your optimization in the hands of our SEO professionals, and let us do the hard work for you! 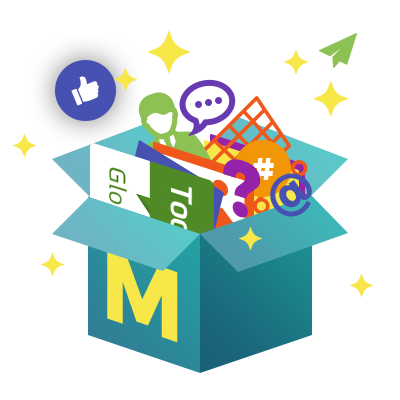 We offer 3, 6, or 9 month content optimization packages so you can continually optimize your content as search engine algorithms evolve. All of these plugins and more are included in our Yearly Membership Plan! Quickly build a unique glossary or dictionary of terms and definitions on your WordPress site. Terms will automatically generate new content and internal site links, improving your SEO. Quickly turn your WordPress site into an online business directory, just like Yelp or Yellow Pages! Build a searchable database of paid, local listings fully customizable listing profiles. A comperehensive forum plugin that works just like StackOverflow. 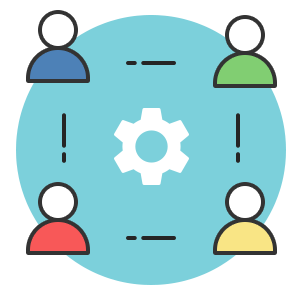 Create multiple discussion forums, with categories, voting, and more.